Madison Chock and Evan Bates perform their Short Dance at the 2016 U.S. National Figure Skating Championships. 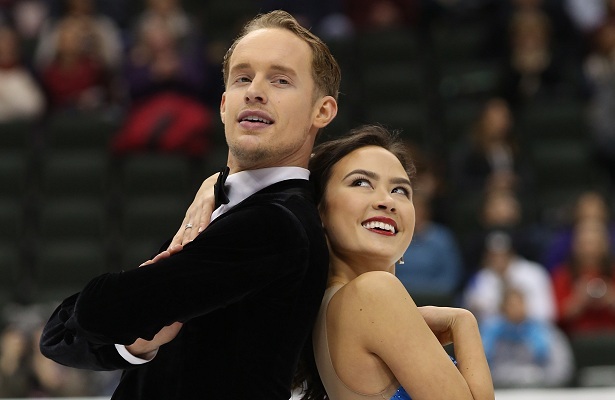 Madison Chock and Evan Bates are the current leaders after the Short Dance at the 2016 U.S. Figure Skating Championships, which is taking place in Saint Paul, Minn. Maia Shibutani and Alex Shibutani are close behind, while Madison Hubbell and Zachary Donohue sit in third. Chock, 23, and Bates, 26, delivered a smooth foxtrot and waltz, earning no less than “2s” on every single element. They received a level four everything except for the second pattern (level three) of the waltz in which they missed one key point. They scored 75.14 points. The ice dancers anticipated that the short dance scores would be close with the Shibutanis right behind them by just half a point. This has been the most challenging season for the 2015 World silver medalists in that they had to change their short dance mid-season. They also made a lot of changes with their free dance during the Grand Prix circuit. After the Grand Prix Final, they took a few weeks off during the holidays and came back refreshed. Maia, 21, and Alex, 24, were just as flawless, if not more so. While they met all six key points, the difference came down to the grades of execution (GOE) in their total score of 74.67. Hubbell, 24, and Donohue, 25, didn’t disappoint either. The current U.S. bronze medalists met all six key points and earned a level four on all elements except for the partial step sequence (level three). Like the top two teams, Hubbell and Donohue earned positive GOEs on all elements and scored 71.10 points. The 2014 Four Continents champions were really happy with their performance. Anastasia Cannuscio and Colin McManus are currently in fourth place with 63.12 points, followed by Kaitlin Hawayek and Jean-Luc Baker (63.02). Next Story → Chan’s back!